A while ago I wrote an article with some CSS tips, now it’s time to give some polish to our HTML! In this article I’ll share some tips and advice about HTML code. Some of this guidance will be best suited for beginners – how to properly build paragraphs, use headings, or improve forms, but we will also discuss SVG sprites for icons, a somewhat more advanced topic. Most of our writing is structured in paragraphs, and there is an HTML element for that: <p>. Do not use the line break tag <br> to separate blocks of texts into pseudo-paragraphs, since line breaks are not meant for that. Headings tags, from <h1> to <h6>, have an implicit rank assigned to them, from 1 (most important) to 6 (less important). To handle semantics properly, pick your heading rank in sequential order, not just because of the size that the browser will use to render the heading. You can – and should!– use CSS for this, and pick a suitable rank instead. Another thing to take into account is how to create subheadings or tag lines to accompany headings. The W3C recommendation is to use regular text markup rather than a lower-rank heading. The placeholder attribute in <input> form elements will let you show an example value to the user that is automatically erased once the user types anything in the field. Placeholders are meant to show examples of formatting valid for a field. Unfortunately, in the wild there are a lot of placeholders acting as <label> elements, informing of what the field is instead of serving as an example of a valid input value. This practice is not accessible, and you should avoid it. It is crucial to provide typing hints for people browsing from a mobile device, like a phone or a tablet. We can easily achieve this by picking the correct type for our <input> elements. For instance, type="number" will make a mobile phone display the numeric keypad instead of the regular alphanumeric keyboard. The same goes for type="email", type="tel", etc. 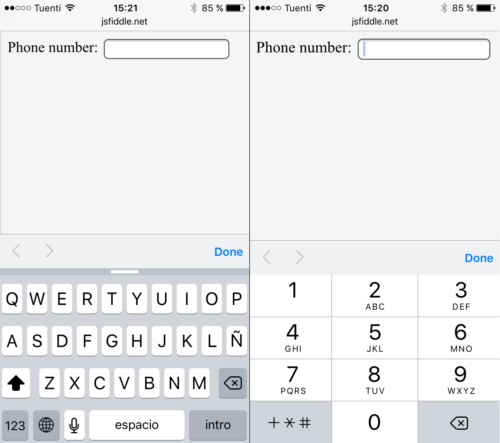 Here is a comparison: on the left, the keyboard that shows up when using type="text"; on the right, the keyboard for type="tel". You can also use SVG sprites to implement vector icons in your website, instead of using a Web Font – which is a hack, and might not yield perfect results. This is because browsers treat Web Font icons as text, and not as images. And there are other potential problems, like content/ad blockers disabling the download of Web Fonts. If you would like to learn more about this, watch this talk by Sarah Semark about why using SVG for icons is better than using a Web Font. You can also read more about this technique on CSS-Tricks. Does creating an SVG spritesheet seem tedious? Well, that’s why there are tools like gulp-svgstore to automate the process and generate a spritesheet from your individual asset files. And remember, since we are using a <svg> tag instead of an <img> to include the picture, we can then use CSS to apply styles. So all the cool things you can do with Web Font icons, can be done with these SVG icons as well! There are some CSS limitations though: when using SVG this way, with <use> linking to a <symbol>, the image gets injected in Shadow DOM and we lose some CSS capabilities. In this case, we can’t cherry-pick which elements of the SVG to apply the styling to, and some properties (e.g., fill) will only be applied to those elements that have them undefined. But hey, you can’t do this with Web Font icons either! In the demo below, you can see an example of a SVG sprite in action. When you mouse over the image, the torch’s fire will change its color via CSS. I hope that these tips are helpful. If you have any questions, or would like to share your own tip, please leave a comment!